Every year brings its own unique challenges, and the 2017 season was no different! One of the great things about being a young agronomist is encountering new issues every year and learning from other agronomists/farmers/industry professionals to work through the issues. This career has provided me with the opportunity to learn new things every year as no two years are alike and each year brings a new set of challenges for disease, insect and weed issues. I am currently in my fourth year working as an independent agronomist in the Moose Jaw/Regina area. Crops this year had bugs, bugs…and more bugs! 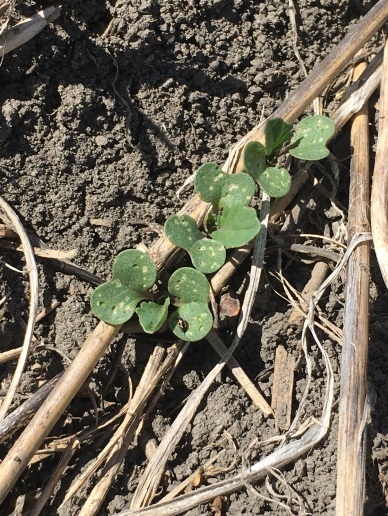 For canola, it was one of the toughest years that I have had when it comes to insect pressure. To start off the season we had cutworms and flea beetles in canola, then as the canola started flowering we had cabbage seedpod weevils come in, and once the canola was fully podded we started finding higher diamondback populations than in previous years. Bertha armyworms were found in pockets of the province, but thankfully were not widespread. Other insects of mention were aphids in lentils and wheat midge in wheat and durum. Lesson: It was a great year to gain experience identifying various stages of insects! With the varied pressures of these bugs throughout my territory, we were able to see how different populations of insects impacted the level of damage and how thresholds played a role in this. It was a challenge to make the call on whether the field should be sprayed or not on fields near threshold, and we were able to learn from our decisions to spray/not to spray. One of the biggest challenges this year impacted all of our crops and was something that we had no control over. We had a severe lack of rain this season right from the start. Early on, there was uneven germination in crops resulting in multiple stages throughout one field. This impacts spray timing for fungicide and desiccation. In this case, we learned to look at which stage the majority of the field was at. Lesson: It’s amazing to see what a plant can do! The root systems that this year’s crops developed in order to access water from the soil were tremendous, and went deeper and deeper as the season progressed. With the heavy clay soils in this area we saw lots of soil cracking and compaction issues. Plant roots were able to grow through this and keep crops actively going until the end of the season, with yields that were a welcome surprise to many growers and agronomists. Challenge #3: Should I Spray or Should I go? Deciding whether or not to spray fungicide was a difficult call to make this past year. This decision was even more difficult following years with consistently high disease pressure high disease pressure in 2016 and previous years. Fusarium has been an issue in durum in the last few years, but with drought conditions this season some farmers questioned if it was worth spraying for. The majority of the durum and lentil acres did get sprayed for disease this year. In canola, only a few fields ended up being sprayed with fungicide as the dry weather was not conducive to Sclerotinia pressure. Lesson: Consider environmental factors when making a spray decision and make these decisions on a field by field basis. Pockets of a larger area may have caught extra rains that may influence a decision on whether to spray or not. This may be different than what other fields in the area are like, but I learned to be careful not to make blanket recommendations across all fields. This past year was a learning experience for me as an agronomist. I am already anticipating next year to see what challenges we will face next!